Home / The Archives / Poll: Where do you wash your bike? Warren has wrapped up the parking poll, so let’s start a new one. Where do you clean your bike? I take my bike to the car wash and blast it with a pressure washer. The bike shop has a bike cleaning service I use. I wash it in my yard/patio/driveway. I wash it at my friend’s yard/patio/driveway. I wash it outside at my apartment complex. I wash it outside where I work. I take it inside and wash it in my bath/shower. What kind of moron washes their bike? Leave a comment and let us know how you keep your bike clean. I guess I’ll go with number 3, though I actually put my bikes on my maint. stand in my garage to clean it. I sometimes wait until the accumulated weight is sufficient for the dirt to fall off on its own (#8? ), but when I do wash the bike, #3 might be closest. Like Ahd Child, I use a bucket of water and a rag to wipe it down inside the back room of my house. sometimes when a mountain bike gets extremely muddy i wash it at the car wash with the spray nozzle — but without feeding quarters into the machine, which seems to make the nozzle operate at a mellow pressure and not the high pressure paying produces. i use sram chains and soak them in a jelly jar filled with simple green when they get nasty. a pot with hot soapy water & a dish brush cleans the cassette and chainrings. 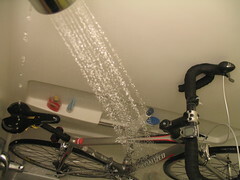 a standard bike bottle with plain water rinses them off. Wash . . .bike . . . I don’t understand these words. For me is #3. I will take my bike(s) that need to be cleaned at wash them in front of the house. My kids get into it and use chalk to create a bike wash area and I help them clean their bikes after I am done with mine. #3 explains it best. Usually find myself using car wash soap which works on all paints/clearcoats. A sponge, bucket, and just the normal water pressure through the garden house works well. Always stay away from pressure washers no matter how muddy the bike gets! I don’t really “wash” any of my bikes. At most I will wipe off the dirt with a damp cloth after it builds up awhile. Dirt provides an excellent protector for the frame against the salt they put on the roads up here. Also, it rains enough that my bike gets washed on its own! I don’t want to get rid of the crunchy dirt coating by washing. But I do occasionally wipe off the chain and grease the hell out of it. Washing? Ummmm…I’m supposed to do that? Seriously, when I do, it’s #3 and is mostly done with a bit a Simple Green on a towel for my road bike. My kids’ bikes get the hose because they like to run through the puddles and mud. I feel that dirt, mud and road grime on a bike can be helpful theft deterrants (along with a good lock system) but when I feel the need, #3 is my choice. #5 when it happens, but more often #8. Riding in the rain helps too. I clean my drivetrain and do all repairs/maintenance etc on a work stand in my apartment. Bucket of 1:10 Purple Power Degreaser:Water and an old rag. Toothbrush for tight spaces. Out on my front patio or in my linoleum front hallway when it’s too cold outside. When the wheels are really, really grimy, I’ll invert it and run them through the shower. Thanks for the input so far, everybody. When I tally it up I’ll probably simplify and knock the number of categories down into something that makes sense. Keep it coming! Just wipe down bike with a clean dry rag. Then wipe of chain and lube. Quick ride through all the gears, and I’m good to go. During cold or wet weather, #7, in the shower. After winter rides through the grimy, slushy, salty muck the bike gets a shower before I do. Is that wrong? #3 when it’s nice outside. A clean bike is faster, it’s a scientific fact! Sometimes I LOOK at my bike real hard and think about washing it even harder and then I grab a screw-driver and gouge off one or two strips of grease from the sprockets then it’s time to GO damnit! So I dump the tool and jump on the saddle and forget all about washing my bike once again.